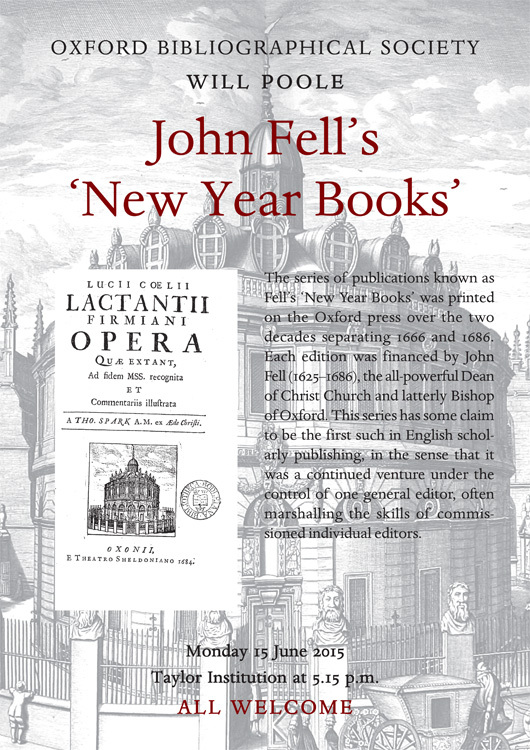 The series of publications known as Fell’s ‘New Year Books’ was printed on the Oxford press over the two decades separating 1666 and 1686. Each edition was financed by John Fell (1625–1686), the all-powerful Dean of Christ Church and latterly Bishop of Oxford. This series has some claim to be the first such list in English scholarly publishing, in the sense that it was a continued venture under the control of one general editor, often marshalling the skills of commissioned individual editors. This paper will approach this series from the point of view of both the bibliographer and the intellectual historian – Fell wished to impose both his educational and his ecclesiastical views on his contemporaries, and these books were part of that campaign.